You love being a Mom or a Grandma. 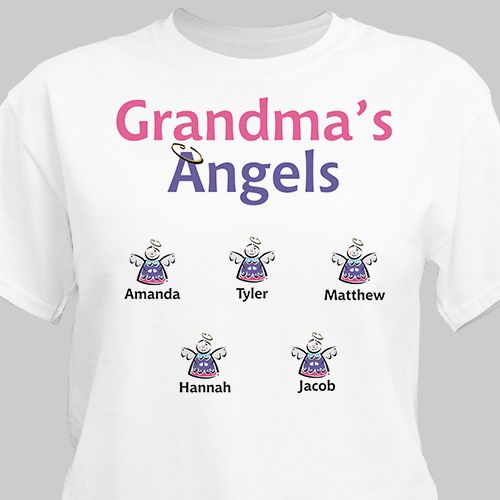 Now show off your kids and grandkids with this delightful Angels Personalized T-Shirts that will be cherished forever. Every Angel Personalized Shirt are Available on our premium white 100% cotton T-Shirt, machine washable in adult sizes S-3XL. Free personalization includes any title and up to 30 children or grandchildren’s names. Each child's name is printed with their own angel. Nice shirt. Grand Childrens names much too small. Additional Details Personalized Angels shirt for Mom and Grandma make great Christian Gift ideas for the Christian Mother and Grandmother on Mother's Day.